This is the second post in a series on President Barack Obama’s African American appointees. To read the first, on Eric Holder, Jr., click HERE. U.S. Trade Representative Ron Kirk. B.A. (Political Science and Sociology), Austin College; J.D., University of Texas School of Law. 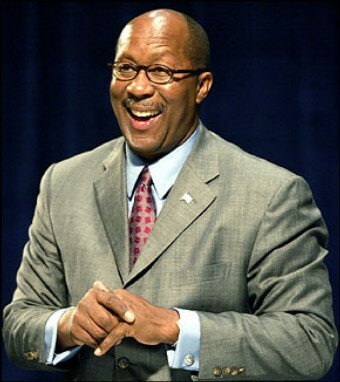 The buzz on Ron Kirk: Texas pride shows through in the coverage of Ron Kirk’s appointment as US Trade Representative. Many local area reporters celebrate his all-Texas educational credentials. Those sources that go beyond a simple listing of Kirk’s credentials emphasize his achievements at majority white schools, during a period when racial tensions were high in his home state. This former mayor of Dallas was a student leader at his high school during a time when anti-Black sentiment divided many Texas communities. He was also one of only a small number of Black students at Austin College, where he distinguished himself as one of an even smaller number of students to complete an internship with the speaker of the Texas House of Representatives. Check out: “The New Team — Ron Kirk,” in The New York Times; “Obama Appoints Ex-Dallas Mayor as First Black Trade Rep,” Afro.com; “Austin College Alum Ron Kirk Appointed to Key Obama Cabinet Post,” Austin College News and Events; “US Trade Representative: Who is Ron Kirk?,“AllGov.com.